Posted on March 7, 2015 by Hawaii's Local Buzz. It’s pretty hard to improve on our raw honey from Hawaii, but a delicious way to enjoy it regularly is to whip up a batch of honey butter. This delicious spread can be kept in your cupboard and spread on your favorite baked goods for a tasty breakfast, snack or even lunch. Mix the two ingredients together in a medium-sized bowl until they are smooth and creamy. For this recipe, we recommend using our Creamed Lehua honey, but feel free to try any of our all-natural Hawaiian honey varieties. You might want to use an electric mixer so your hand does not get tired. Beating on medium speed for one to two minutes should be sufficient. When your honey butter is all mixed up, transfer it to a jar and store it at room temperature — there’s no need to keep in in the fridge. Spread honey butter on your toast in the morning for a touch of extra sweetness. Enjoy a sweep of honey butter on your muffins or quick breads to make them even more scrumptious. It’s especially delicious on pineapple macadamia nut bread. Use honey butter to flavor your chicken, pork or fish for a light, sweet delicacy. Pour melted honey butter over your pancakes or waffles, and then sprinkle them with cinnamon for a supremely satisfying breakfast. 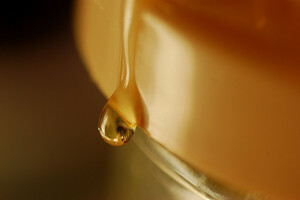 Honey from Hawaii’s Local Buzz is never heated or pasteurized. It’s a 100 percent natural food you feel good about enjoying. Visit our website to order some for yourself. It’s delicious in recipes and even on its own.